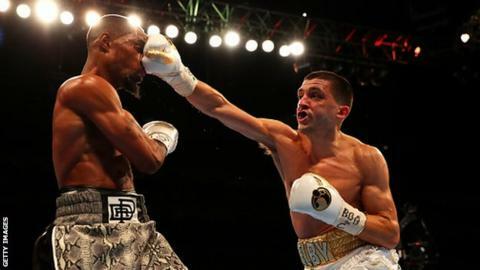 Wales' Lee Selby climbed off the canvas to defend his IBF featherweight title with a unanimous points win over Eric Hunter at London's O2 Arena. Selby, 29, was floored by a left hook in the second round but dominated proceedings thereafter, landing with his right hand almost at will. American Hunter was deducted a point for low blows in the eighth and was also threatened with disqualification. Meanwhile, Doncaster's Jamie McDonnell retained his WBA bantamweight title. Selby, who had never previously been knocked down in either the paid or amateur ranks, said after his victory: "When I got put down it was only a flash knockdown. I've got one of the best chins in the business and I wasn't hurt. He was a good fighter but I was too good for him." Selby made a confident start but found himself on the canvas in the second round when a peach of a left hook by Hunter caught him off-guard. Selby regrouped in the third, landing with a volley of big right hands, and it was more of the same in the fourth and the fifth. Hunter was more competitive in the middle rounds but Selby, boxing on the retreat, continued to land with the more eye-catching shots. The American's task became more onerous when he was docked a point for low blows in the eighth and in the ninth the referee warned his corner that their man would be thrown out if he continued to flout the rules. Two of the 29-year-old challenger's three previous defeats were disqualifications, one for low blows. Hunter did well to make it to the final bell but Selby won comfortably, 115-111, 116-110, 116-110 on the judges' scorecards. Selby's second successful defence of the title he won last May brings a domestic match-up with Leeds' Josh Warrington a step closer. Commonwealth champion Warrington fights Japan's Hisashi Amagasa next Saturday. Selby, who now has 23 wins and one defeat from 24 pro fights, is also open to a match with Belfast's IBF super-bantamweight champion Carl Frampton. Mexico's Fernando Vargas, a late replacement who needed two goes to make the weight, proved a surprisingly game opponent for McDonnell. But after eight uneventful rounds, McDonnell tagged the challenger with a chopping right at the end of the ninth and Vargas' corner threw in the towel. McDonnell, 30, who improves to 28 wins, two defeats and one draw, has plenty of options at 118lb, including a possible unification fight against Bristol's IBF champion Lee Haskins. He has also spoken about moving up to super-bantamweight to fight Scott Quigg, who lost his WBA title to Carl Frampton in February. Birmingham's Matt Macklin outpointed Blackpool's Brian Rose in a grim middleweight battle of former world title challengers. Macklin, who has failed in three world title tilts, had vowed to retire if he lost again but was awarded the fight 113-113, 115-111, 115-111. However, the 34 year old, who emerged from the contest badly marked up and with a closed left eye, might choose to call it a day regardless of the result. George Groves continued his quest for a fourth world title shot with a routine fourth-round stoppage of Scotland's David Brophy. Having already lost two world title challenges against Carl Froch, Londoner Groves was beaten by WBC super-middleweight champion Badou Jack last September. But after improving to 23 wins (18 KOs) and three defeats, Groves said he was prepared to fight anyone, including Britain's latest 168lb sensation Callum Smith. Conor Benn, son of British boxing legend Nigel, marked his professional debut with a first-round stoppage of Ivailo Boyanov. Like his father before him, Benn was decked out all in black and displayed some of the same mannerisms, including the wide stance and twitching head. Boyanov gave almost as good as he got, until Benn hurt him with a vicious left to the body followed by a left to the head, at which point the referee had seen enough.